Users can now run FishTrack's hi-res satellite imagery via a new iOS app available in iTunes.. 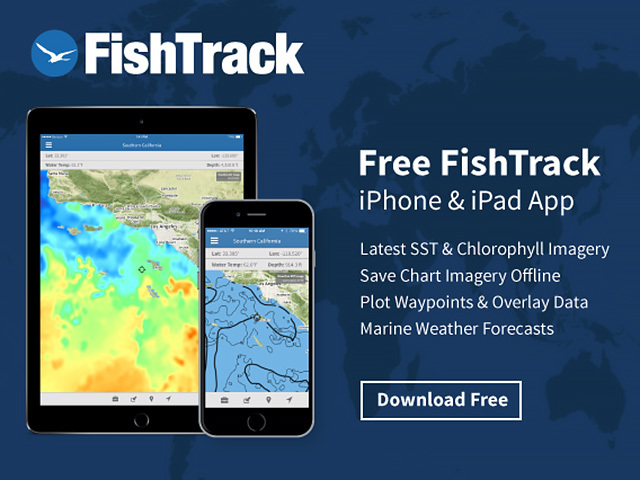 The FishTrack App offers free Cloudfree Sea Surface Temperature (SST) Charts, Global Satellite Imagery and Marine Forecasts all in one layered tool. You can also save imagery for offline use to help you find hot spots while navigating offshore. The FishTrack App offers a range of satellite imagery to help anglers pinpoint the best possible fishing spots. True Color Images (left) helps users find color breaks offshore. This shot also has the Points of Interest layered over top. These points can be weather buoys, oil rigs, canyons or structure. 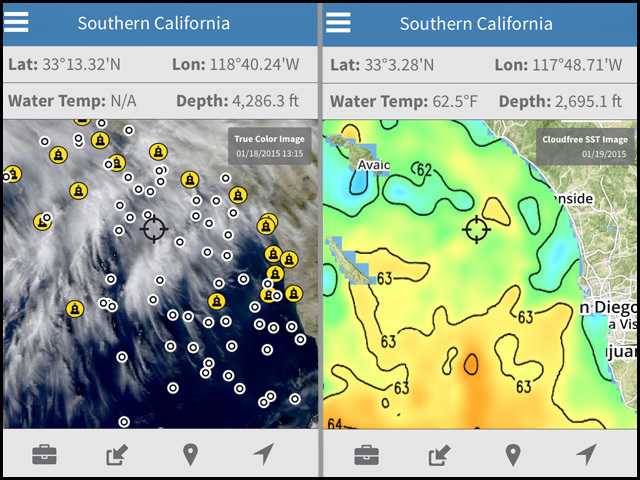 The photo one the right shows cloudfree water temps using contours and color to help anglers find exact temp breaks offshore. The FishTrack App can be used on the boat even when out of range by saving a chart image. Once the chart is saved you can pull up the satellite info, complete with tide and current overlays to find fish. The Waypoint and Routing Tool (right) allows you to create a course and determine the heading you'll need to take as well as the nautical miles of the trip from one mark to the next. These routes can be saved for future use. Finding saltwater game fish just got a lot easier. With the new app from FishTrack.com, anglers can research water conditions and marine weather for the world's best offshore fishing locations right from their mobile device and find the best potential spots before leaving the dock. 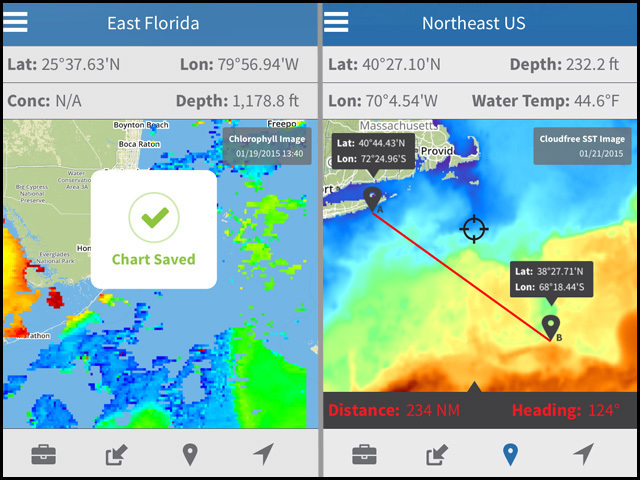 The FishTrack App provides everything anglers need to find fish, including the latest cloud-free and high-resolution Sea Surface Temperature (SST) charts, Chlorophyll images, Ocean Altimetry, Currents, Bathymetry, Moon Phase and Tides, as well as Buoyweather Marine Forecasts. The FishTrack app is free via iTunes, and provides SST data for the entire globe, including more than 85 of the world’s best saltwater fishing destinations. The FishTrack app is easy to use, and several in-app tutorials will help first-time users navigate their way through the tools offered. When the user first opens the app and sets their location, the latest cloud-free SST image will display. This chart can be repositioned and zoomed in or out using the same intuitive finger motions smartphone users are accustomed to. As the user moves the chart, updated position coordinates, water temperature and depth readings are displayed at the top of the screen. The user can then access and layer additional imagery using the toolbox on the bottom of the screen. Additional data currently offered includes Chlorophyll Imagery, Hi-Res SST, True Color Images, Sea Surface Height, Currents, Bathymetry, Points of Interest, Marine Forecast by Buoyweather, and Tides/Solunar tables. Don't fish blind. Download the free FishTrack App today to get started.